Learn what dietary patterns and lifestyle habits can prevent and treat chronic liver disease. The liver is one of the hardest-working organs in the body, performing more than 500 functions vital for life and health, including carrying away waste and breaking down fats in the small intestine (thanks to bile), producing proteins and cholesterol, converting excess glucose into glycogen for storage, regulating blood levels of amino acids, storing iron, clearing the blood of drugs and bacteria, and regulating blood clotting. If any of these functions go awry, illness that sometimes can lead to death occurs. "Anyone with obesity, prediabetes, type 2 diabetes, or metabolic syndrome is at increased risk of NAFLD,"6 says Jill Weisenberger, MS, RDN, CDE, CHWC, FAND, consultant and author of Prediabetes: A Complete Guide: Your Lifestyle Reset to Stop Prediabetes and Other Chronic Illnesses and Diabetes Weight Loss — Week by Week, "so it's logical to use liver enzymes [as a way] to screen anyone with these conditions." 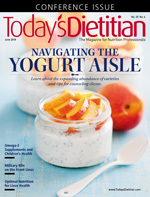 "While genetics play a small role in the condition, prevention is essential and includes management of a healthy weight, a low- or no-added sugars diet, regular physical activity, and a whole foods diet," according to Kristin Kirkpatrick, MS, RD, LD, president of KAK Consulting in the Denver area and author of Skinny Liver: A Proven Program to Prevent and Reverse the New Silent Epidemic — Fatty Liver Disease. While symptoms can include fatigue and pain in the upper right abdomen,1 NAFLD is usually asymptomatic, so diagnosis typically results from the incidental finding of abnormal liver enzymes during routine blood work. This is usually mildly raised transaminases (alanine transaminase (ALT) and aspartate transaminase, and/or gamma-glutamyltransferase). However, this is a broad screening tool. If NAFLD has progressed to inflammation and cirrhosis, symptoms may include abdominal swelling, enlarged blood vessels just beneath the surface of the skin, enlarged breasts in men, red palms, and jaundice (yellowing of the skin and eyes). Can Liver Disease Be Treated? In the past, cirrhosis of the liver was considered irreversible.11 The definitive answer to the question today is "maybe." Reversal of liver damage depends on the stage of the disease, its causes, and whether patients consistently follow treatment protocols. "The condition is reversible as long as it has not progressed to the later stages," Kirkpatrick says. "Stabilization of blood sugar and weight loss are absolutely essential to reversal of the condition." Below are some of the primary lifestyle factors that often lead to NAFLD and its complications. The majority of people with NAFLD are either overweight or obese. Individuals with morbid obesity typically have greatly enlarged livers as a result of fat accumulation. Gradual weight loss can reverse the condition. Simple carbohydrates in the diet, in particular fructose, have been linked to NAFLD.18,19 People with NAFLD consume a larger quantity of soft drinks than those without the disease. Soft drinks are high in fructose (high-fructose corn syrup), and fructose stimulates fatty acid and triglyceride synthesis in the liver. Lifestyle alteration, including dietary changes, plays a critical role in the prevention and treatment of NAFLD. While no dietary recommendations exist that are tailored specifically to NAFLD, the research to date suggests that following dietary and lifestyle guidelines for maintaining a healthy weight, and reducing the risk of type 2 diabetes, metabolic syndrome, and CVD apply to reducing the risk of and treating NAFLD and its complications. "Some research suggests a Mediterranean-style diet may be beneficial,"27 Weisenberger says, adding that while there isn't much research on NAFLD and dietary components, there's research on diet and insulin sensitivity, which is closely associated with NAFLD. The healthful DASH (Dietary Approaches to Stop Hypertension) eating pattern presented in the US Dietary Guidelines for Americans should minimize risk of insulin insensitivity and NAFLD in individuals who have no other identifiable causes for the disease. 1. Nonalcoholic fatty liver disease. Mayo Clinic website. http://www.mayoclinic.org/diseases-conditions/nonalcoholic-fatty-liver-disease/symptoms-causes/syc-20354567. Accessed April 20, 2018. 2. Definition & facts of NAFLD & NASH. National Institute of Diabetes and Digestive and Kidney Diseases website. https://www.niddk.nih.gov/health-information/liver-disease/nafld-nash/definition-facts. Updated November 2016. Accessed April 20, 2018. 3. Nseir W, Hellou E, Assy N. Role of diet and lifestyle changes in nonalcoholic fatty liver disease. World J Gastroenterol. 2014;20(28):9338-9344. 4. Alcohol-related liver disease. American Liver Foundation website. https://liverfoundation.org/for-patients/about-the-liver/diseases-of-the-liver/alcohol-related-liver-disease/. Accessed April 20, 2018. 6. Obesity and overweight. Centers for Disease Control and Prevention, National Center for Health Statistics website. https://www.cdc.gov/nchs/fastats/obesity-overweight.htm. Updated May 3, 2017. Accessed April 20, 2018. 7. Sadek R, Wassef A, Mikhail J, Melman L. Prevalence of non alcoholic fatty liver disease in an obese population: expected versus actual correlation. Surg Obes Relat Dis. 2016;12(7 Suppl):S203. 8. Wójcik-Cichy K, Koślińska-Berkan E, Piekarska A. The influence of NAFLD on the risk of atherosclerosis and cardiovascular diseases. Clin Exp Hepatol. 2018;4(1):1-6. 9. Arslan N. Obesity, fatty liver disease and intestinal microbiota. World J Gastroenterol. 2014;20(44):16452-16463. 10. Dyson JK, Anstee QM, McPherson S. Non-alcoholic fatty liver disease: a practical approach to diagnosis and staging. Frontline Gastroenterol. 2014;5(3):211-218. 11. Jung YK, Yim HJ. Reversal of liver cirrhosis: current evidence and expectations. Korean J Intern Med. 2017;32(2):213-228. 12. Hemochromatosis. National Heart, Lung, and Blood Institute. https://www.nhlbi.nih.gov/health-topics/hemochromatosis. Accessed April 20, 2018. 13. Shah K, Stufflebam A, Hilton TN, Sinacore DR, Klein S, Villareal DT. Diet and exercise interventions reduce intra-hepatic fat content and improve insulin sensitivity in obese older adults. Obesity (Silver Spring). 2009;17(12):2162-2168. 14. Larson-Meyer DE, Newcomer BR, Heilbronn LK, et al. Effect of 6-month calorie restriction and exercise on serum and liver lipids and markers of liver function. Obesity (Silver Spring). 2009;16(6):2162-2168. 15. Adams LA, Angulo P. Treatment of non-alcoholic fatty liver disease. Postgrad Med J. 2006;82(967):315-322. 16. Wang D, Wei Y, Pagliassotti MJ. Saturated fatty acids promote endoplasmic reticulum stress and liver injury in rats with hepatic steatosis. Endocrinology. 2006;147(2):943-951. 17. van den Berg SA, Guigas B, Bijland S, et al. High levels of dietary stearate promote adiposity and deteriorate hepatic insulin sensitivity. Nutr Metab (Lond). 2010;7:24. 18. Zelber-Sagi S, Nitzan-Kaluski D, Goldsmith R, et al. Long term nutritional intake and the risk for non-alcoholic fatty liver disease (NAFLD): a population based study. J Hepatol. 2007;47(5):711-717. 19. Basaranoglu M, Basaranoglu G, Sabuncu T, Senturk H. Fructose as a key player in the development of fatty liver disease. World J Gastroenterol. 2013;19(8):1166-1172. 20. Beysen C, Ruddy M, Stoch A, et al. Dose-dependent quantitative effects of acute fructose administration on hepatic de novo lipogenesis in healthy humans [published online March 20, 2018]. Am J Physiol Endocrinol Metab. doi: 10.1152/ajpendo.00470.2017. 21. Browning JD, Baker JA, Rogers T, Davis J, Satapati S, Burgess SC. Short-term weight loss and hepatic triglyceride reduction: evidence of a metabolic advantage with dietary carbohydrate restriction. Am J Clin Nutr. 2011;93(5):1048-1052. 22. Alferink L, Kiefte-deJong JC, Veldt B, et al. Animal protein is the most important macronutrient associated with non-alcoholic fatty liver disease in overweight participants: The Rotterdam Study. J Hepatol. 2017;66(1 Suppl):S50. 23. Pichon L, Huneau JF, Fromentin G, Tome D. A high-protein, high-fat, carbohydrate-free diet reduces energy intake, hepatic lipogenesis, and adiposity in rats. J Nutr. 2006;136(5):1256-1260. 24. Bassuk SS, Manson JE. Epidemiological evidence for the role of physical activity in reducing risk of type 2 diabetes and cardiovascular disease. J Appl Physiol (1985). 2005;99(3):1193-1204. 25. LaMonte MJ, Blair SN, Church TS. Physical activity and diabetes prevention. J Appl Physiol (1985). 2005;99(3):1205-1213. 26. Suzuki A, Lindor K, St Saver J, et al. Effect of changes on body weight and lifestyle in nonalcoholic fatty liver disease. J Hepatol. 2005;43(6):1060-1066. 27. Baratta F, Pastori D, Polimeni L, et al. Adherence to Mediterranean diet and non-alcoholic fatty liver disease: effect on insulin resistance. Am J Gastroenterol. 2017;112(12):1832-1839.